Recently my friend Wendy Tweten wrote that she went fishing for puny trout with “ginormous” tremor worms. Another friend Jeanne Keyes wrote about chasing painted ladies (butterflies) around her kitchen, while I’m sitting next to the window soaking up the warm afternoon rays of a February sun. Hey guys, catch anything? During a break from homework, I took a quick nap, a common occurrence these days. Today is my birthday and I’m getting closer and closer to another big-0 decade. Any more, I just say I’m plenty-nine, even if it’s really plenty-seven this year. What does this have to do with gardening? Everything. I have a dozen projects I want to do in the garden, but my get-up-and-go got-up-and-went somewhere—most likely south for the winter. Those heavy projects I once tackled with much exuberance, such as building rock walls, shoveling gravel, soil or sand, just doesn’t seem to be something I want to do anymore. I’m looking to simplify and downsize the garden. What are good ways to streamline gardening besides pouring concrete over everything? My sun garden is slowly letting the shade creep in as the trees I planted over the last decade are maturing enough to cast their shadows. This means there is room for more ferns and other woodland plants! More importantly, more shade means less weeds to tackle. 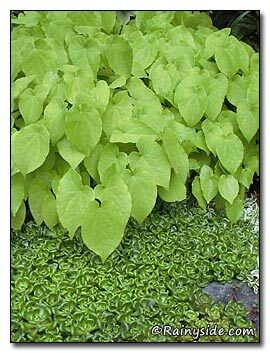 I need to cover more ground with small shade tolerant shrubs or tough perennials, such as bishop’s hat (epimediums.) A vigorous one is Epimedium alpinum, a weed suppressing plant with wonderful chartreuse new foliage. This perennial needs to be sited carefully because of its tendency to creep around in good soil. Heavy clay soil slows it down, but eventually the plant will fill an area. This is not a suitable perennial for sharing space with sweet, docile, little shade lovers. Although, if you are into action-packed garden thrillers featuring ritualistic plant sacrifices, or epimedium gangs taking over the garden ‘hood, spilling chlorophyll in their wake, watching the land-grabbing carnage, this plant might be fun for you. Ok they really aren’t that bad, but admit it—the carnage made you take notice. Read on. Sturdy ferns and perennials, such as royal ferns (Osmunda regalis) and hellebores hold their own against this creeping epimedium, so it’s not really a thug (it just plays one on TV.) Its creeping habits are slow enough to keep in check, especially when it’s not watered much during our drought season. 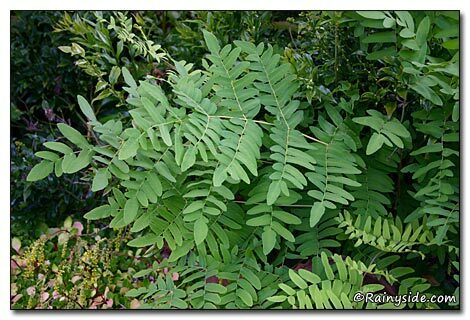 The light-hued, evergreen foliage looks fantastic planted under dark green, ferny foliage. In my garden Epimedium alpinum covers the base around a large rhododendron, and is creeping over to greet the glossy, dark foliage of a sweet box shrub, Sarcococca confusa, under the coral bark maple, Acer palmatum 'Sangokaku'. The garden bed is very easy to keep weeded when it’s packed tightly with plants. And because I tend to be a collector of plants, Epimedium alpinum takes over the planet helps unify everything.